For more than forty years, William James “Bill” Murray has been delighting and fascinating both audiences and critics with superb comedic performances and off-set antics. The Big Bad Book of Bill Murray: A Critical Appreciation of the World’s Finest Actor, written by Robert Schnakenberg, chronicles this iconic actor’s life from the early years when he worked as a golf caddy to support his own education, to his days at Second City and Saturday Night Live, through legendary comedic roles in movies like Caddyshack and Groundhog Day, to today as Murray continues to reinvent himself with more dramatic roles and cameos in random strangers’ photographs. Schnakenberg adoringly documents each and every one of Murray’s movie roles. Beyond that, The Big Bad Book of Bill Murray is chock-full of photographs from behind the scenes, color film stills, stories of career highs and lows, controversies, and tales of the legend that is Bill Murray. The Big Bad Book of Bill Murray is more than just a biography, it is a love letter to the often enigmatic star and a must read for his fans. 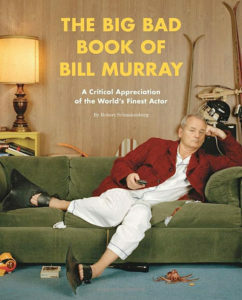 The Big Bad Book of Bill Murray can be purchased at Amazon, or at your friendly neighborhood book store.